I asked myself the same question when Sarah Broome from Filtered Media presented me with the opportunity to both try a PushPan for myself and host a giveaway. 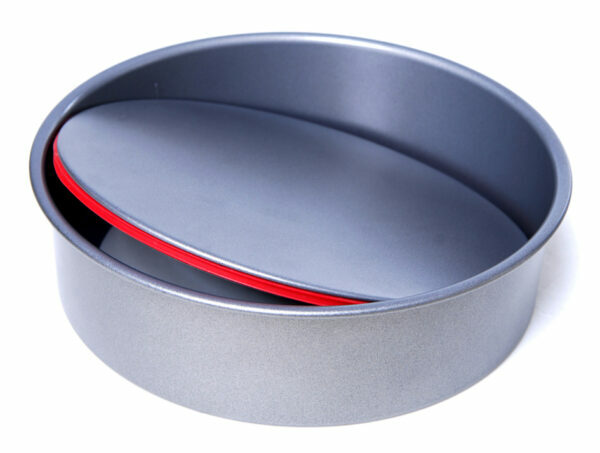 The Profiline PushPan is an innovative loose‐based, watertight cake tin. Each tin has a uniquely integrated silicone seal on its loose base that guarantees no cake mixture will find its way out of the pan. And since not a drop of water can get in, the PushPan is ideal for baking a cheesecake in a water bath, without the worry of fashioning a lining or wrapping your pan in foil first. Since I’ve started the giveaway, I’ve already been asked some questions. Yes, the tins are very sturdy and durable. They are of professional quality. And yes, the one cake I’ve made so far in the tin was easy to push out. As for how the tins actually work? Check out the PushPan video! 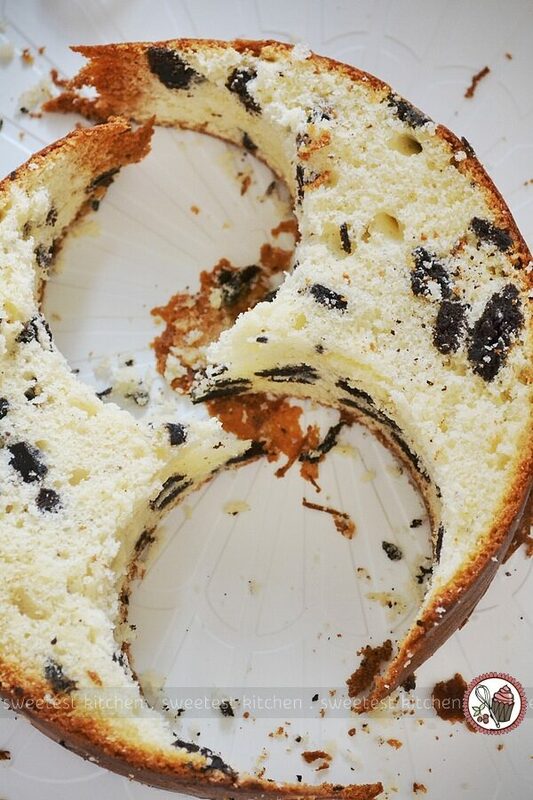 To test out my 20cm PushPan, I decided upon a cookies and cream cake. To prepare the PushPan, you’ll need to grease it with a bit of butter, but not non-stick cooking sprays. Then push the loose bottom in the cake tin, gently but firmly, until it can’t be pushed further. Here is where I almost became confused as I had pushed the bottom in upside down! The way I will remember it from now on is that the Profiline PushPan logo needs to be facing up! 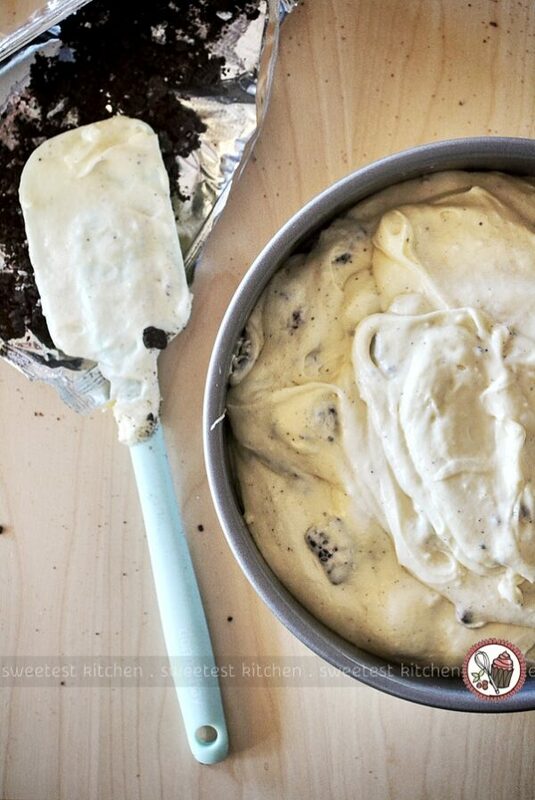 Then fill the tin with your cake batter. 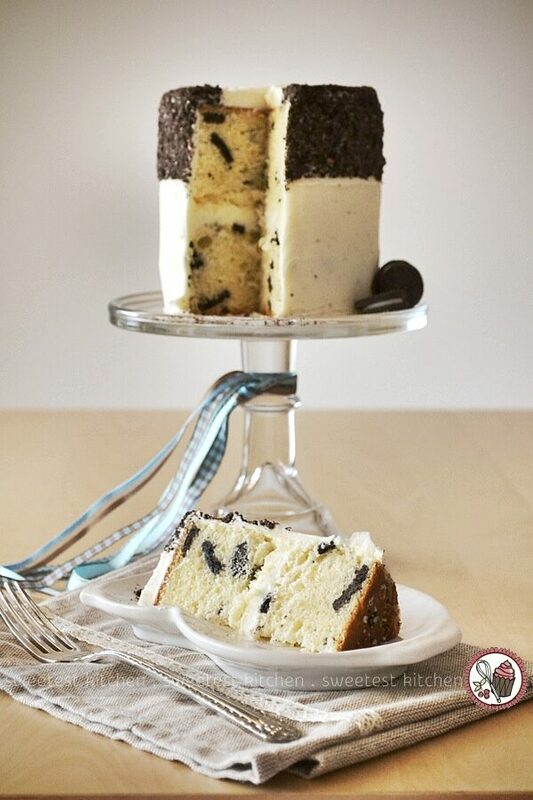 In my case, a basic vanilla cake with chunks of Oreos. Pop it in the oven, watch it rise beautifully and evenly, then wait for it cool (or at least until you can handle the tin without burning your hands). Now comes the part you’ve been waiting for. 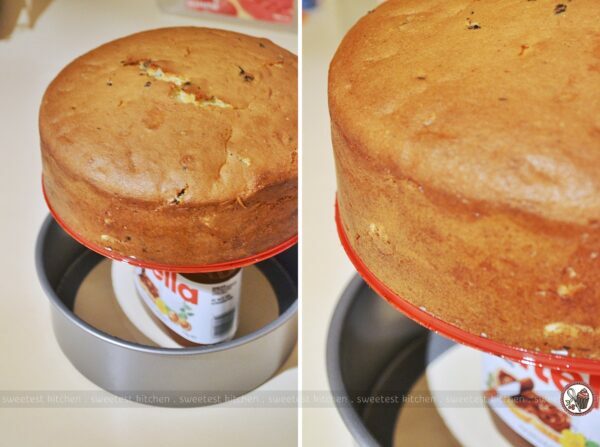 To remove your cake, place the tin on a wide, tall can (in my case, a very large jar of Nutella) and pull down evenly on the outer ring of the tin. Ta-da! A beautiful golden cake! To remove the bottom of the cake tin, place your hand or a plate on top of the cake, invert it and gently lift off the bottom. 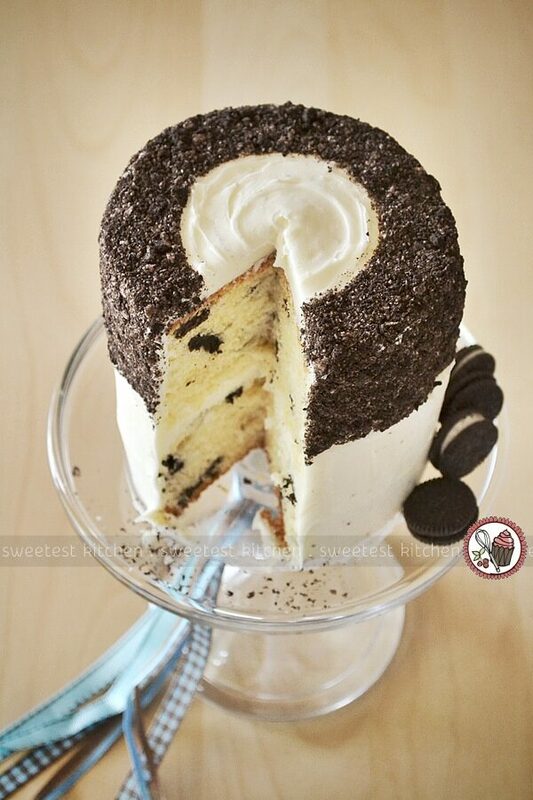 I decided to go with a mini cookies & cream cake, so I cut out two circles from this big cake. 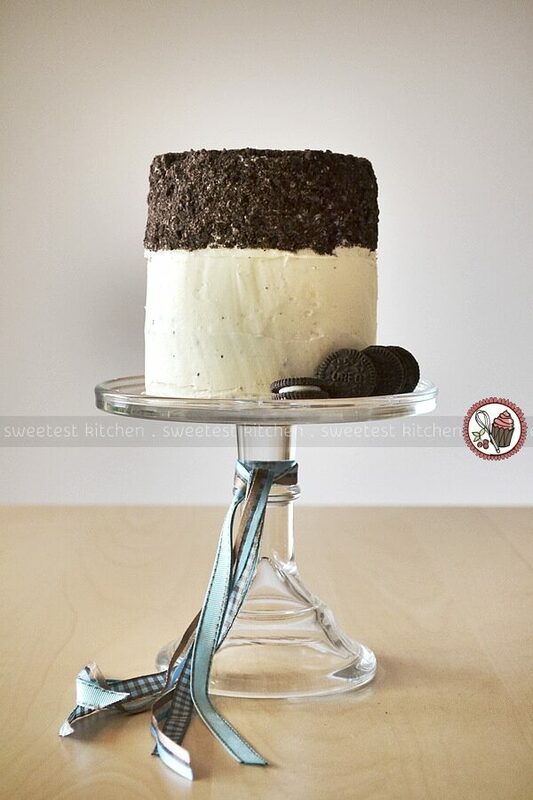 And then frosted it with Oreo crumb-infused vanilla buttercream. 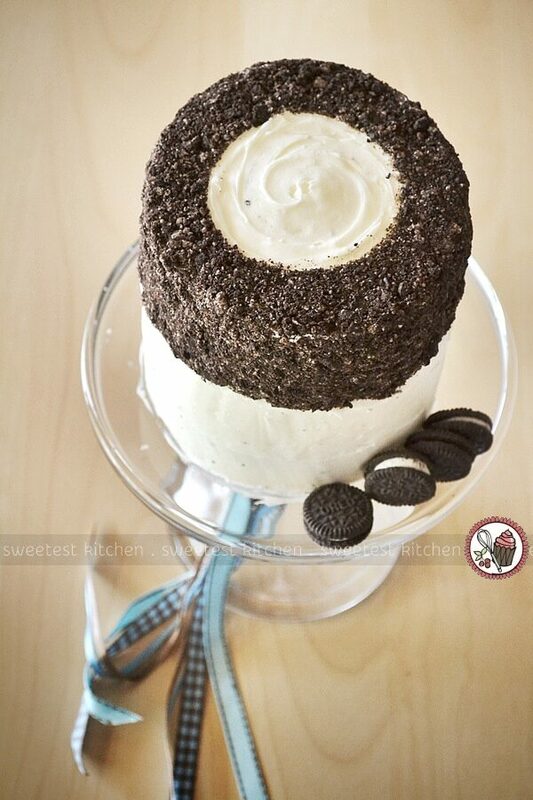 To which I very tediously applied a ring of Oreo crumbs! This was done by lining the frosting with parchment paper on the parts I didn’t want to have crumbs on. I can definitely say that the PushPan is fantastic and I can’t wait to use it to bake some cheesecakes, which I normally avoid because I don’t want to waste time wrapping the tin with foil and worrying about whether it’s covered properly. Do not use non-stick cooking sprays to grease the tin (not sure why, maybe it damages the coating somehow?). Make sure the Profiline PushPan logo on the loose bottom is facing up. The tin is oven safe up to 260C. The tin is dishwasher safe; no need to remove the silicone seal (I’m not even sure it comes off?). The silicone seal is made from FDA approved materials. The tin is made from heavy gauge steel and the double coating is PFOA-free. Are you keen to get some Profiline PushPans for yourself? 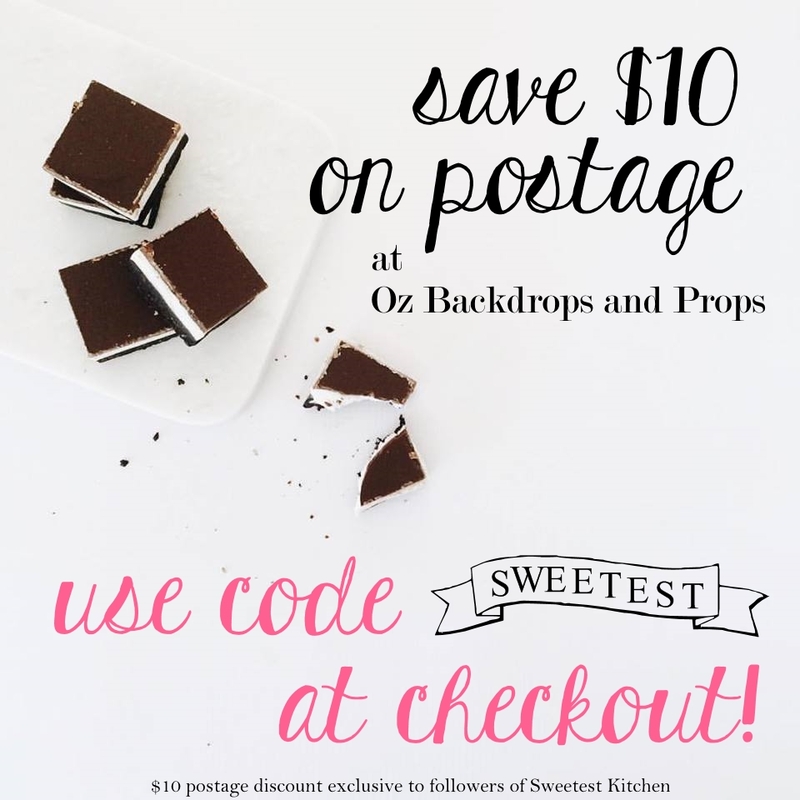 If you’re in Australia, check out my giveaway post before 15/7/2013 for a chance to win a set worth $172. Of if you can’t wait, find out where to buy them at the PushPan website. And be sure to watch The Great Australian Bake Off, starting tonight on Channel 9 at 8PM to see the PushPans in action! Your cake looks so sweet. Miniature cakes always look cuter for some reason. I’m definitely tempted to purchase a Profiline PushPan now after seeing it in action! i hadn’t heard of the pushpan, so thanks for letting us know! it looks like it creates a lovely cake layer. i’d be interested to try it. your cake looks amazing! The PushPan sounds great! And I love the cake. It looks so divine! I’m desperate! After making a divine tart in the PROFILINE PUSHPAN I CANNOT RELEASE the base ! I have put it on a large tin of tomatoes and pushed, pushed and pushed and it will not budge. The base is in place, with the logo showing up right. Can you please tell me what I’m doing wrong .. maybe this happened to you and maybe I’m doing something wrong.